World Cup 2018 Group A consist of Russia, Saudi Arabia, Egypt and Uruguay. Find here our World Cup 2018 Group A betting preview including predictions on Group Winner, To Qualify, To Finish 2nd, To Finish Bottom and Straigh Forecast. Plus, the best odds, betting promotions and no deposit free bets on Russia 2018! In this post, we'll take a closer look at Group A and try to determine which two nations are likely to prevail. Russia qualified automatically as hosts and judging by their Fifa points rankings, and current form, this is the only reason they're playing at a World Cup. They will hope to get a boost from what is certain to be a hugely vocal home support. Manager Stanislav Cherchesov has extensive knowledge of the game in his country, having spent most of his coaching career in Russian domestic football. The 54-year-old has assembled a squad of players who virtually all ply their trade in the Russian Premier League since he started managing the national team, and boasts a 31.25% win rate. Last march, they lost both their friendlies at the hands of France (1-3) and Brazil (0-3). With Krasnodar striker Fyodor Smolov wearing the captain’s armband, Russia will hope to advance to the knockout stage, relying on a number of stars from CSKA Moscow and Spartak Moscow. They were disappointing in international friendlies but their attack is impressive. Aleksandr Kokorin leads the goalscoring charts of players currently in the squad with 12, while Smolov has 11 and Alan Dzagoev nine. Russia have qualified for the World Cup on three occasions, in 1994, 2002 and 2014 but have yet to make it out of the group stage. With a home boost, will this be the year? Saudi Arabia missed out in 2010 and 2014 but are back after finishing ahead of Australia in their qualifying group. They reached the round of 16 in 1994. Manager Bert van Marwijk steered the team through qualification but left just days after the successful conclusion of the campaign. He was replaced by former Argentina coach Edgardo Bauza but he has since been sacked after just five games in charge. Former Spain striker Juan Antonio Pizzi is now at the helm and the 49-year-old can draw on 13 years of managerial experience, including a stint in charge of Chile. He played for Barcelona and has managed Valencia in La Liga, meaning he won’t be fazed by the prospect of a World Cup campaign. They recently beat Greece 2-0 on 15th May but lost 4-0 to Belgium and drew 1-1 against Ukraine last March. Veteran central defender Osama Hawsawi skippers the side and will lead out a team comprised almost exclusively of home-based stars, as there are strict laws that prevent players from playing for foreign clubs if they hold only Saudi citizenship. Al-Nassr striker Mohammad Al-Sahlawi led the way in qualifying with an amazing 16 goals and much will depend on the 31-year-old in Russia. Elsewhere, experienced midfielder Taisir Al-Jassim bagged six and can boast 124 caps for his national side, while winger Salem Al-Dawsari is one to look out for with four goals from 26 outings, including a couple in 2017. Egypt eased into the 2018 World Cup by topping their qualification group, and will make their third ever appearance in the finals. The Africans first appeared at the 1934 World Cup, but had to wait until 1990 for their second chance at the event. However, hopes are high this time around with experienced manager Hector Cuper pulling the strings for the past three years. The Pharaohs are the 14th side he has coached, while spells at clubs such as Valencia and Inter Milan prove that he has the pedigree to work at the top level. The 62-year-old has international experience too, spending a year in charge of Georgia and he has made Egypt a tough side to beat with a strong defence. The squad is a mixture of home-based payers and some star names who have opted to play abroad. Essam El-Hadary captains the side at the age of 45 and will hope to add to his 155 caps in Russia, plus Arsenal’s Mohamed Elneny and West Brom duo Ali Gabr and Ahmed Hegazi are likely to feature. Clearly, however, it is Mohamed Salah whose name leaps off the team sheet. The 25-year-old failed to shine at Chelsea but, after spending time at Roma, moved to Liverpool in the summer of 2017, and so far - the rest is history. He has scored goals for fun all season long and become one of the most feared strikers in the Premier League, going from strength to strength. Unsurprisingly, he topped the qualification goalscoring charts with five and will have several other Premier League players for company at the World Cup, including plenty from Liverpool. Runners-up to Cameroon in this year's African Nations Cup, Egypt booked their place in Russia with victory over Congo and a game to play, courtesy of a late goal scored by the team's star player Mohamed Salah. Their last notable success at a major tournament was in 2010, when they lifted the Africa Cup of Nations for the seventh time. In recent friendlies, Egypt suffered back to back defeat against Portugal (2-1) and Greece (1-0). Uruguay finished second to Brazil in their group to secure their place in the finals and make their 13th appearance at a World Cup. They looked certain for qualification during much of their campaign but it took a final-round victory over Bolivia to make absolute certain. Winners in 1930 and 1950, their next best efforts have been fourth in 1970 and 2010. Atletico Madrid defender Diego Godin captains the side and is a rock at the back, but it is the attacking players that will really have coach Oscar Tabarez purring. Superstar attackers in Barcelona’s Luis Suarez and Paris Saint Germain’s Edinson Cavani have a combined 89 goals this season, and it is obvious that the nation’s hopes will be pinned on these two. The South American outfit has a cosmopolitan feel overall too, with squad members playing all over the world, including some of Europe’s top clubs. Right-back Maxi Pereira has 124 caps, while supporters of Southampton, Hull and Middlesbrough will be familiar with midfielder Gaston Ramirez. Tabarez has been in charge for 12 years and guided his side to the round of 16 four years ago. Can he go even further this time out? Uruguay played two friendlies on march, beating both Czech Republic (2-0) and Wales (0-1). The following are the best prices available on the World Cup Group A Winner market. Click on the 'Bet' button to back your selected team at the odds shown. Undoubtedly one of the most levelled World Cup groups, we're backing Egypt to upset other contenders for the first place. 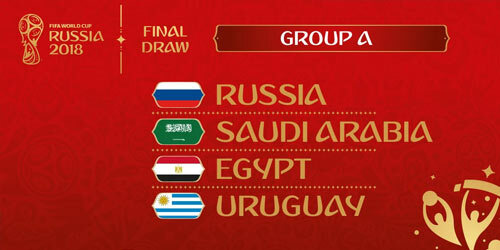 The battle for second place could be a tough affair between Russia and Uruguay while Saudi Arabia are very outsiders. "2018 World Cup Group A predictions, betting tips, odds and free bets"